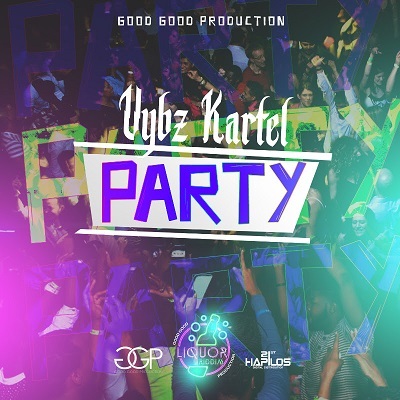 A contender for party anthem of the summer, Vybz Kartel "Party" on Vybz Kartel "Party" on the Good Good Productions Produced Liquor Riddim encompasses all that is reminiscent of summer bashments! While the video shot in Montego Bay Jamaica during Britjam has already garnered close to 30 thousand views in 4 days, the single distributed by 21st Hapilos Digital is now available on iTunes. Yet another summer hit single from the Good Good Productions Liquor Riddim has controversial dancehall star Alkaline sings "Cause me up, she up Nothing like when you and yo girl turned up If you si the wallet, you a go si the purse to Fi mi girlfriend better than yours". The hit bound "Up" by Alkaline is available in all major digital outlets such as iTunes via 21st Hapilos Digital. As Grammy Award winner Beenie Man is in full summer touring, the artist will undoubtedly be touching worldwide stage and perform his latest release "Love Me". Produced by acclaimed Head Concussion Records and distributed by 21st Hapilos Digital, "Love Me" is now available on iTunes. If their past association is any indication, the combination of Billboard producing house TJ Records and billboard international dancehall star Vybz Kartel has delivered yet another sizzling hit. Distributed by 21st Hapilos Digital, the latest production of "My Life Belongs" is now available at all major digital stores including iTunes. Introducing to himself via the web and becoming a viral dancehall sensation, Gully Bop has now proven that he is a bonafide artist and can deliver the hits. His latest single "White Rum" produced by Yard Style Entertainment is getting recognition and making it's way unto the airwaves. "White Rum" is out now on iTunes, distributed by 21st Hapilos Digital. Valrie Muzik presents Vybz Kartel "Don't Give A". The catchy tune has the dancehall superstar sing "Jamaica land we love The vibes yah nice yah suh Light the weed up Party keep on Wave your hand because My life, my life, I don’t give a...". Distributed by 21st Hapilos DIgital, "Don't Give A" is out now on iTunes. Studio Vibes Entertainment presents "Pandora Riddim". The star studded riddim features the musical selections of Grammy Award Beenie Man, Vybz Kartel, Elephant Man, Konshens, Chan Dizzy & J Capri, I Octane, Sizzla & Ninja Kid, Delly Ranx, Munga, Tiana, Delly Ranx, Rico Tayla, Shane Hoosong, G7, Currenci and Formila One. "Pandora Riddim" is out now on iTunes via 21st Hapilos Digital. Famed producers Di Genius Records presents the multi-talented prolific J Carpi with the "Likkle". The single has already taken social media by storm with various viral videos accumulating in almost a hundred thousand plays. Available in all major outlets such as iTunes, "Likkle" is distributed by 21st Hapilos Digital. Distributed by 21st Hapilos Digital and produced under his own imprint label Guzu Musiq, dancehall star Tommy Lee & Sparta presents "Trying to Be Me"(Lonely Road). The hit bound single is available on iTunes via 21st Hapilos Digital. Hitmaker Muzik presents "Towncraft" performed by Hitmaker himself & dancehall artist Kalado. Distributed by 21st Hapilos Digital, "Towncraft" is available on iTunes. A busy summer ahead for both artists, the single is a contender as a top ten summer hit!